So I haven’t blogged in like a month. I fell off the blogging wagon. However, I have very much been on the diet wagon! 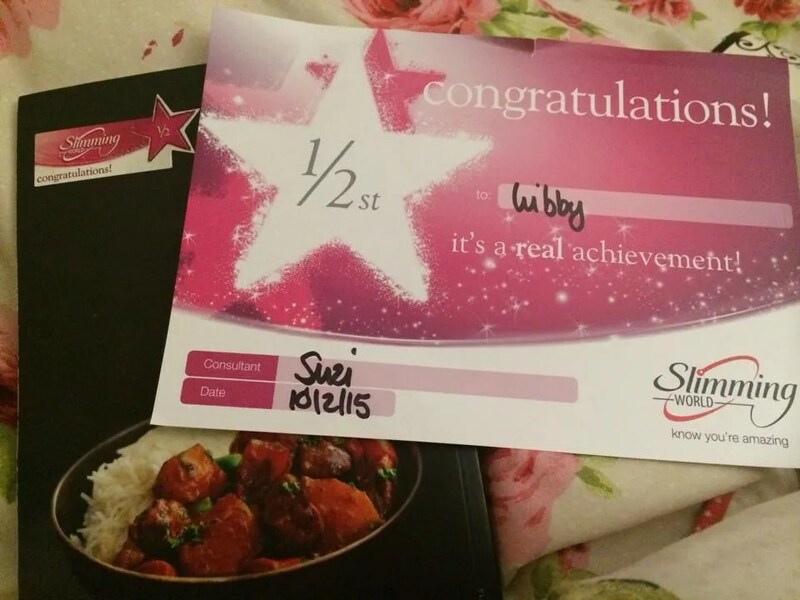 I’ve been at Slimming World for 6 weeks now and I’m very pleased to report I received my 1/2 stone award on Tuesday after an astonishing 2.5lbs loss, for a grand total of 7.5 lbs lost on Slimming World, and 9 lbs lost since the start of the year! Ben has also lost an incredible 10lbs! We’re absolutely chuffed to bits and determined to carry on. I hate to sound like a massive loser but I really am enjoying it. 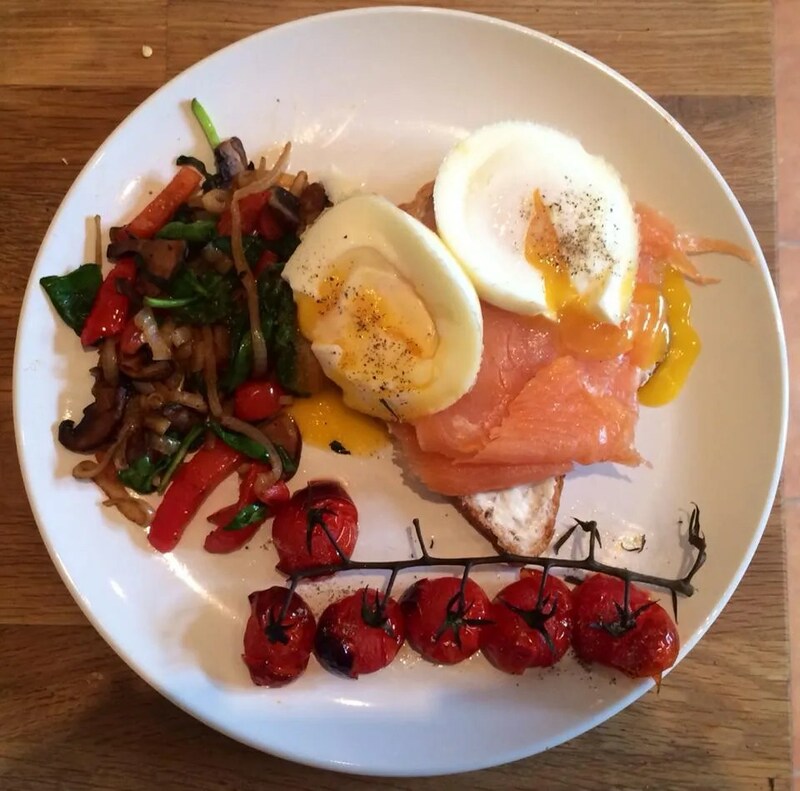 I’m loving the support network I’ve found via Instagram, I enjoy going to group and listening to everyones stories, I’m LOVING the food and don’t feel like I’ve been on a diet at all which is pretty impressive. As I’ve said before, I hate boring food and I’d be so depressed if I had to count calories or felt restricted in any way. Seriously, if we haven’t been shopping for a while and my work lunch consists of a sad collection of vegetables and yogurt or something, it actually ruins my day. We’ve started doing a smaller, weekly shop so we can get all the fresh veg and fruit you need ridiculous amounts of on SW, and this is working really well for us. So, some of the food I’ve been eating! My photos aren’t the best as I take them with my phone instead of doing the right thing and getting my SLR out – in my defence I’m always too hungry (food blogger fail) but I hope I can show that you really cn eat some lovely, exciting food on SW! I do find it slightly upsetting sitting at group and some of the ladies are talking about their dinners like “I’ve had tuna and rice, chicken and boiled veg, lots of Muller Lights…” THERE IS SO MUCH MORE TO LIFE!! I’m still obsessed with porridge. Literally cannot get enough. It fills me up, it’s super low calorie, I don’t have to use any milk…it’s AMAZING. I use the ‘whipped banana’ method as described on KathEats and no, I don’t sun the banana. I’d be eating the banana anyway and it’s way more enjoyable chopped up and mixed into the porridge to create a huge, frothy bowl of banana-ry goodness. Mmm! I have also recently discovered something that has, quite honestly, changed my porridge life. PB2 is a powder made from de-fatted peanuts (?) that tastes exactly like peanut butter with MUCH better stats. Just to give you an idea, a level tbsp of peanut butter is 4 syns. If you mix 2 tbsp of PB2 powder with a little bit of water, it’s 2.5 syns. TWO POINT FIVE SYNS. That’s just over half the syns, for twice the amount. Awesome times. I bought both the regular and chocolate versions from Amazon and I can’t recommend them enough if you’re a peanut butter fiend. 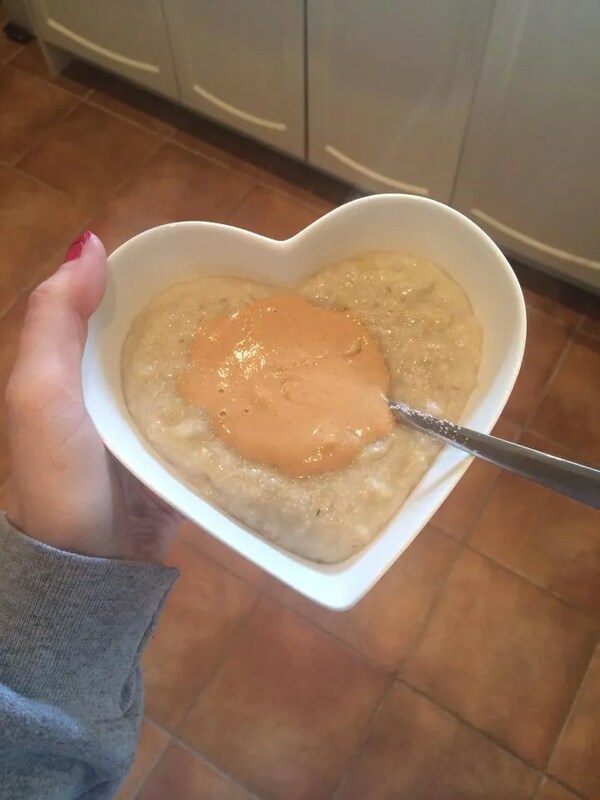 Porridge with PB2…not the most photogenic combination, but definitely a delicious one. 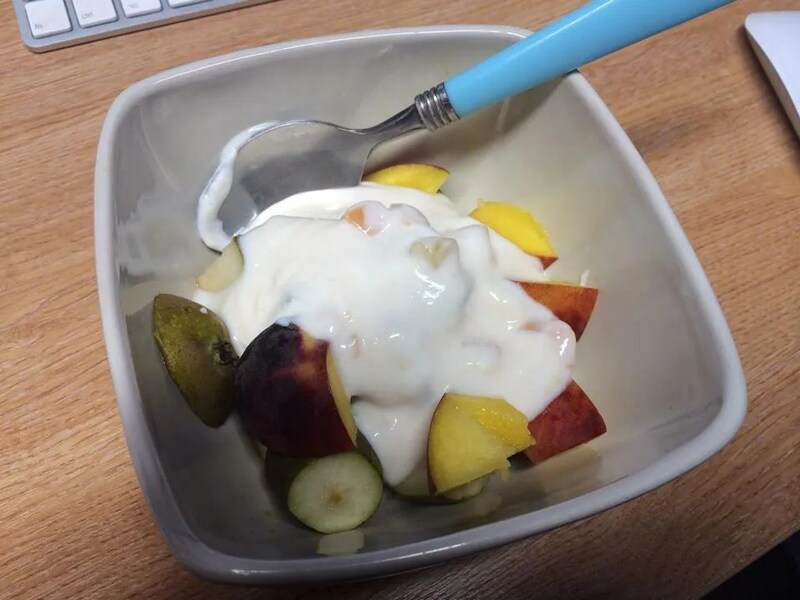 On days when I want to save my HEXB for a wholemeal roll or pitta bread at dinner, I normally just have chopped fruit with a yogurt. Sometimes though, when it’s cold (which it always seems to be!) I fancy something a bit more substantial. 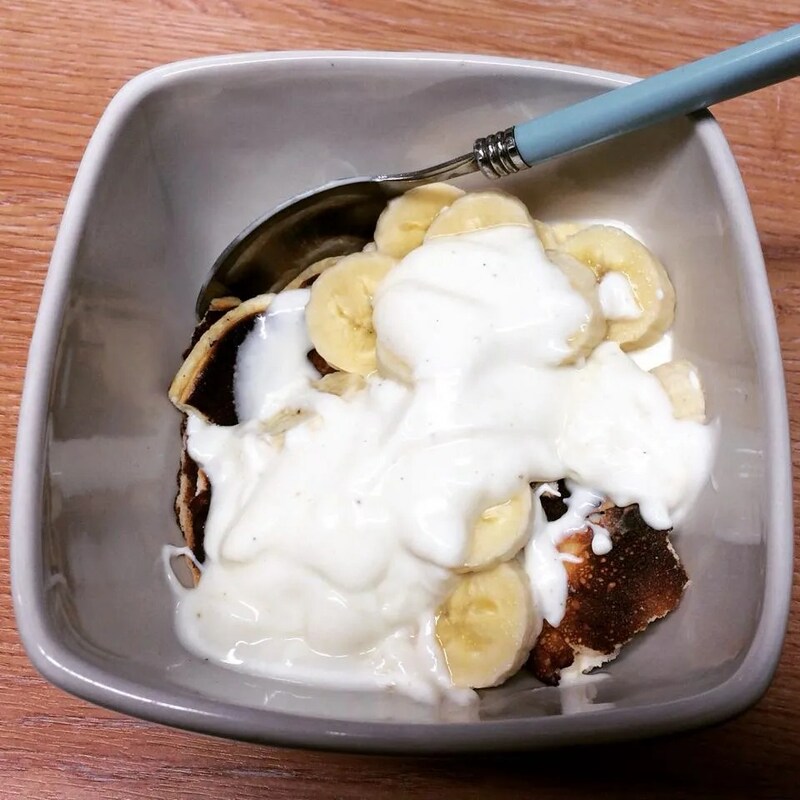 Last week I experimented with a version of the magic pancakes, made even more magic by removing the oats! So it was just an egg. I whipped the white separately, folded in the yolk and some sweetener, and cooked them in a pan with some Frylight. The verdict? Actually okay! They would have been better if I hadn’t been in a massive rush to get to work and accidentally burned them, but definitely something I’d make again at the weekends if I wanted a treat without using my HEXB. Recommended! 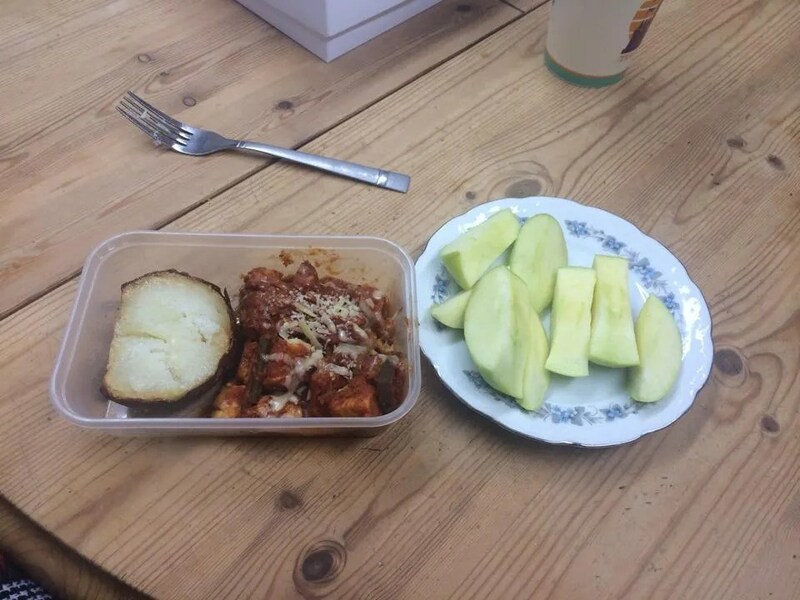 Lunches are usually leftovers with fruit, tinned spaghetti or tuna salads. Gripping stuff. 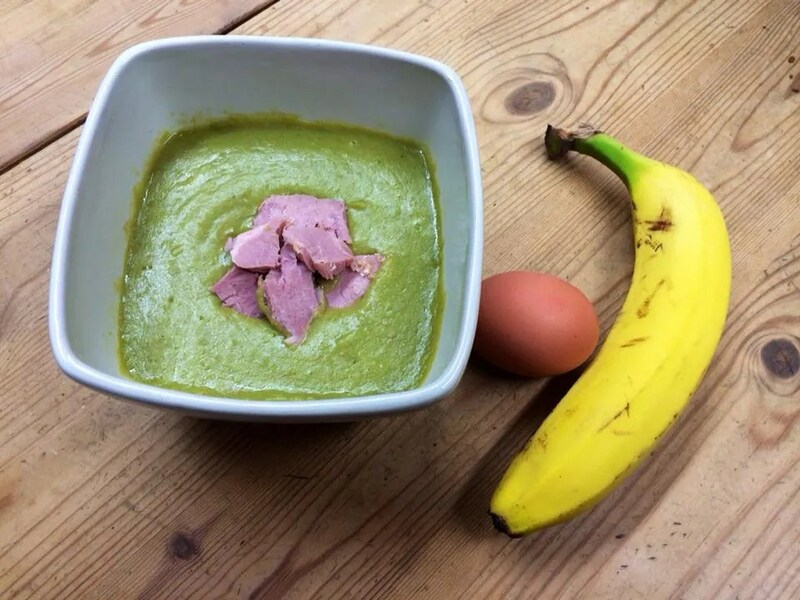 However, this week I made the pea and ham soup from the SW website and loved it! It was so easy to make too, I couldn’t believe it! 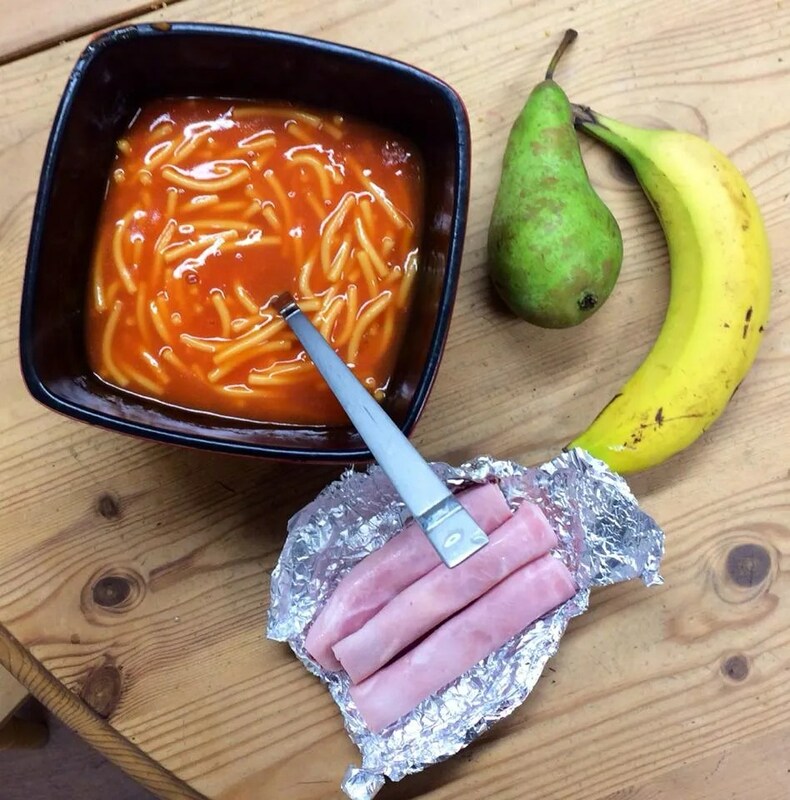 It’s done me for 3 lunches and it tastes delicious. Dinner is the highlight of the day and a chance for us to really experiment and have something a bit more exciting. This was slow-cooker pulled pork in a BBQ sauce (diet coke added, totally makes it!) 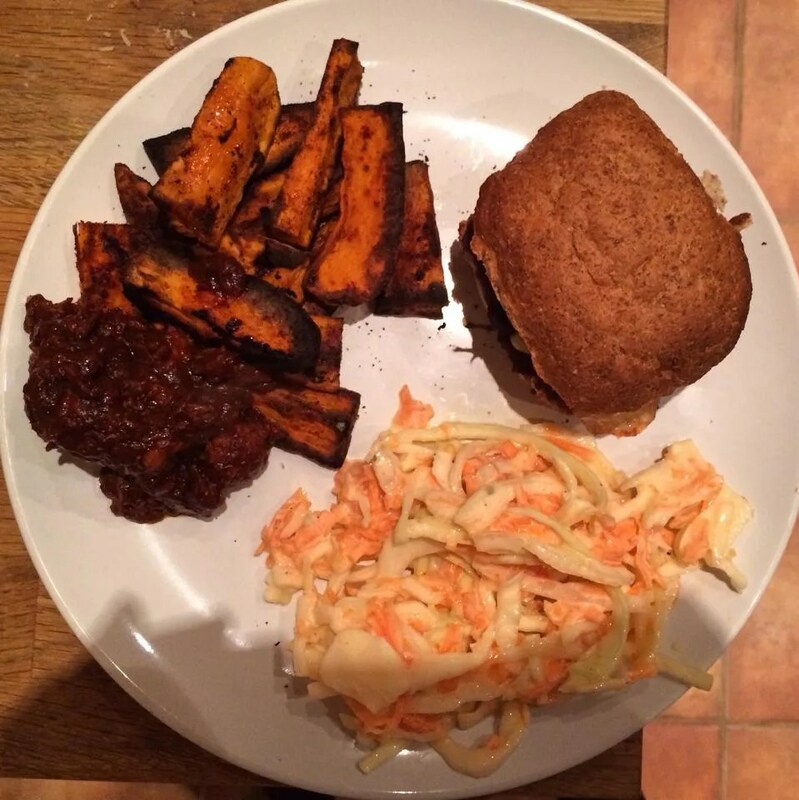 with a wholemeal roll, sweet potato chips and syn-free coleslaw. So good! 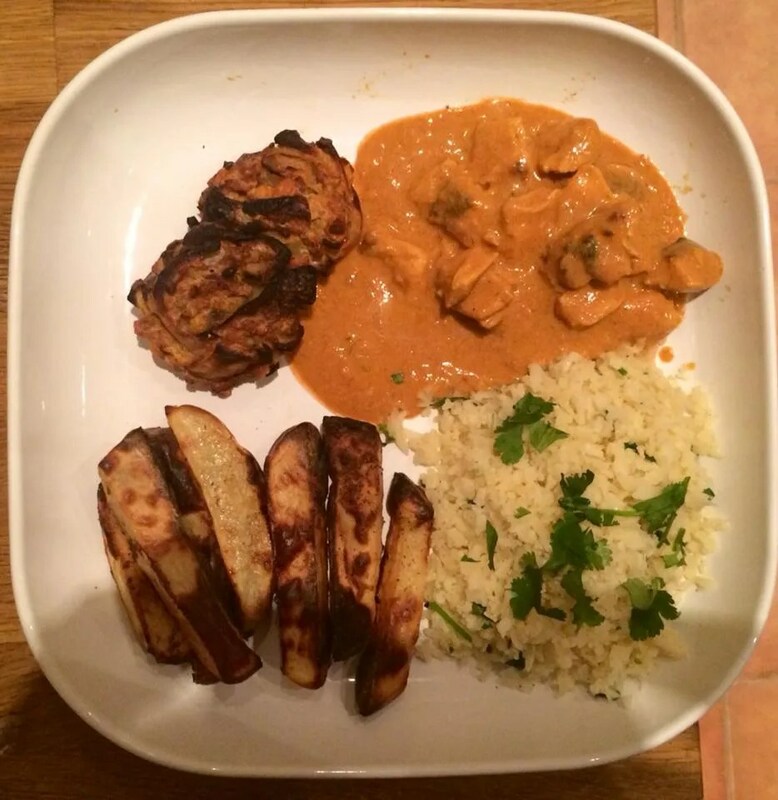 Last Wednesday I randomly decided to make chicken tikka masala from the Fakeaways book (such a great book.) 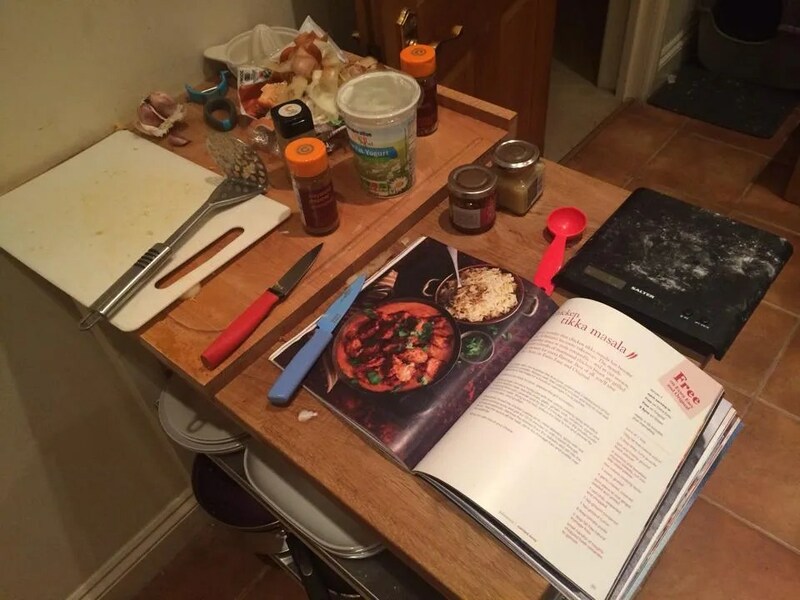 It was a really good recipe, if slightly faffy for a school night, but then that was my own fault. 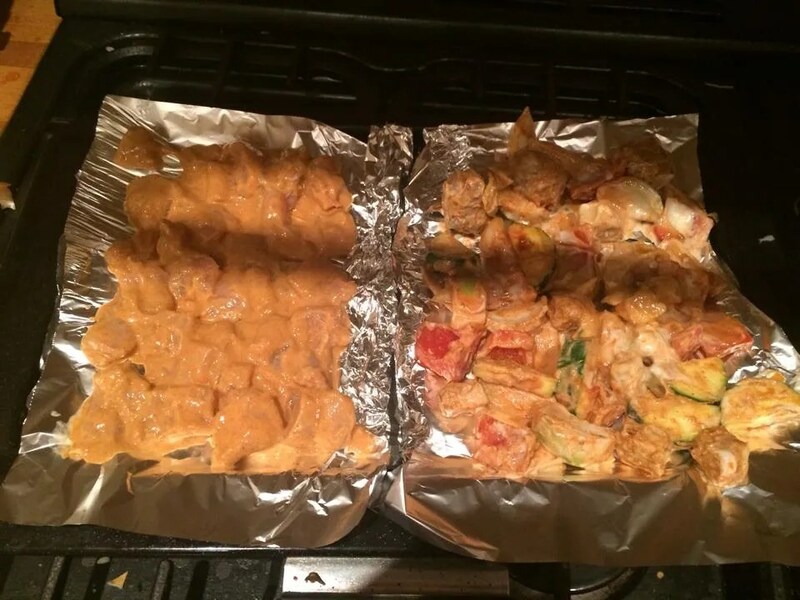 I also made Ben a vegetarian version, which added to the faff (he offered to make his own curry but I wanted to make him this one…schoolboy error) and I also sponatenouslty decided to make SW onion bhajis. So yeah, it was a good 2 hours worth of kitchen time…but it was worth it! I won’t post the recipe because it’s in the book, but here is a gratuitous shot of the meaty and veggie versions simultaneously grilling in the tikka/yoghurt sauce. I probably wouldn’t bother with this step next time as it was crazy amounts of effort and I don’t feel it added a huge amount to the final taste. 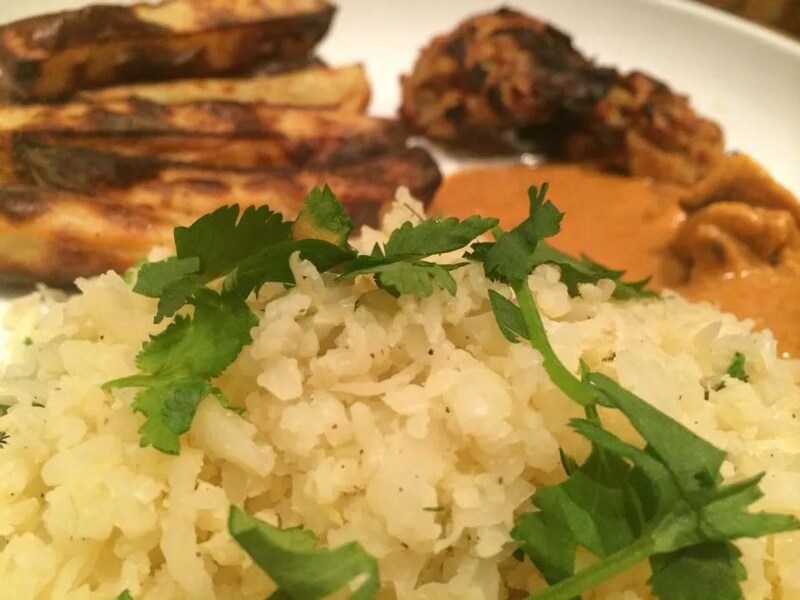 This was also my first experience making cauliflower rice, and I loved it! I bought frozen cauliflower (much cheaper than fresh and lasts longer) thawed it for a bit, grated it using my cheese grater, and sautéed it in a pan with garlic and coriander. It was very rice-like and actually I think I preferred it. Definitely good if you feel like you’ve OD’d a bit on carbs (a common occurrence on Slimming World) although obviously I added chips just to make sure I got those carbs back in. The onion bhajis were really lovely too! They were just mashed chickpeas, sliced onions, curry powder, cumin and coriander, shaped into balls and baked! Definitely recommend if you’re like me and like your Indian Fakeaway to have a bit of everything. 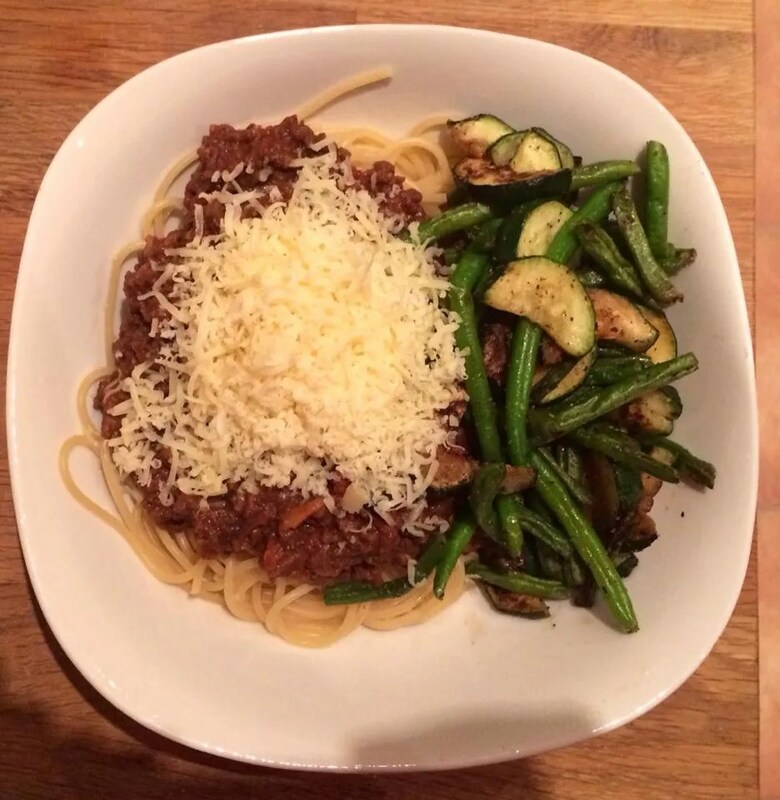 Some nights, only pasta will do. 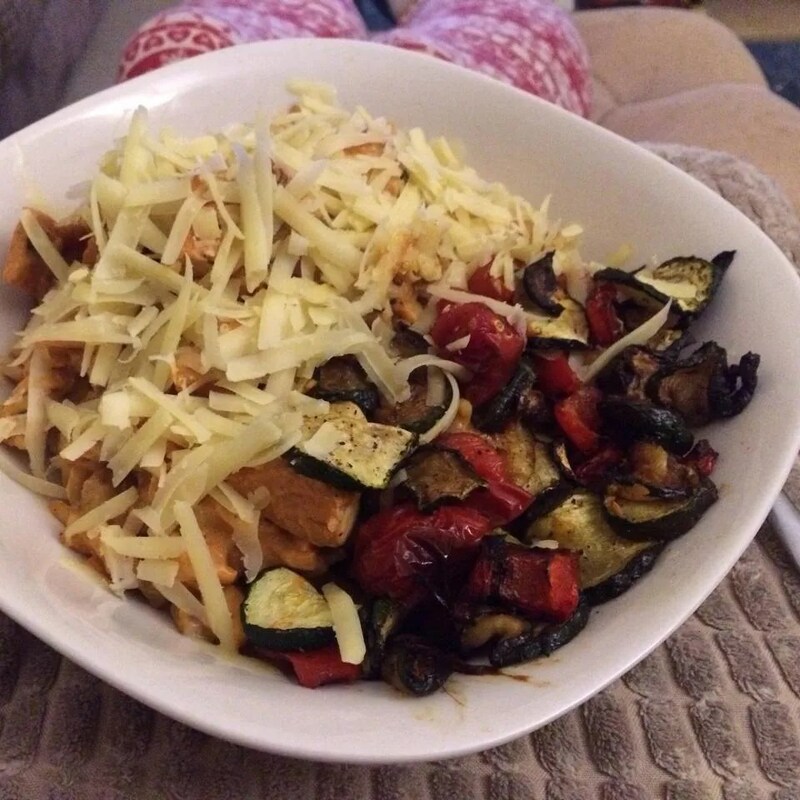 This was a godsend; after a busy day at work I was able to reheat a batch of beef in red wine I’d frozen a couple of weeks earlier, roast some veggies, pile it onto spaghetti and top with my HEXA of cheese. This was creamy tomato pasta bake with chicken and bacon. I much prefer creamy, ‘Alfredo’ style pasta dishes over tomato based so this is a good compromise. I just stir in a few spoonfuls of Quark right at the end of cooking and it adds a lovely creamy flavour. Not as good as actual cream obviously, but if that was the case we’d all be thin and Slimming World wouldn’t exist. 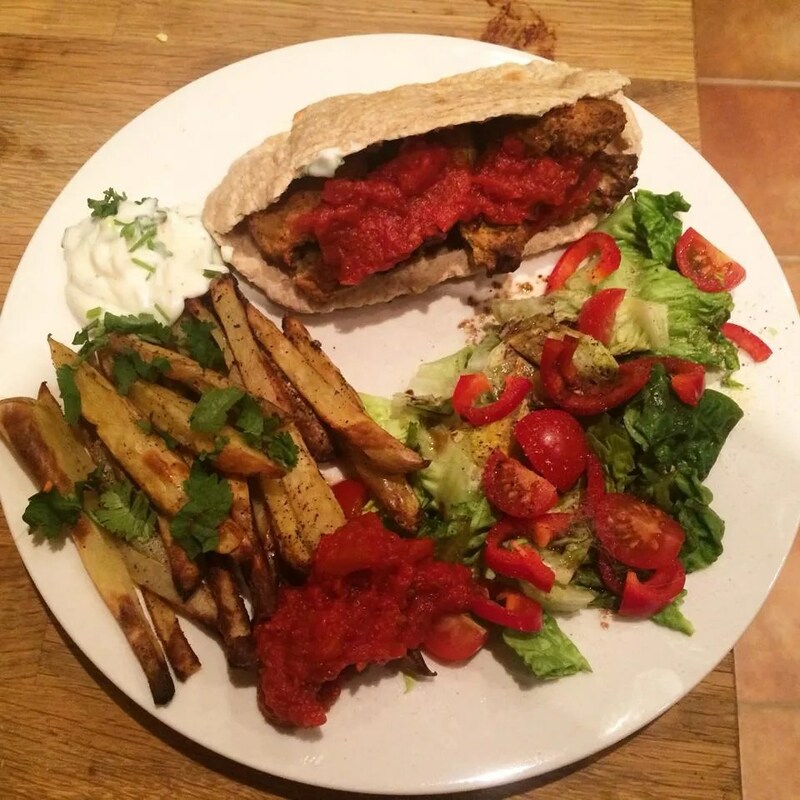 One night I came home to a beautiful meal cooked for me by Mr Ben, homemade SW falafel! Served in a wholemeal pitta bread (the WeightWatchers ones are a HEXB!) with loads of salad, garlicky yogurt, hummus, homemade ketchup and SW chips. This type of food lends itself really well to Food Optimising and we’ll be having it a lot more often now I know Ben can make it!! I’m joking, he loves cooking and would cook more often if I wasn’t such a kitchen nazi and enjoyed it so much myself. 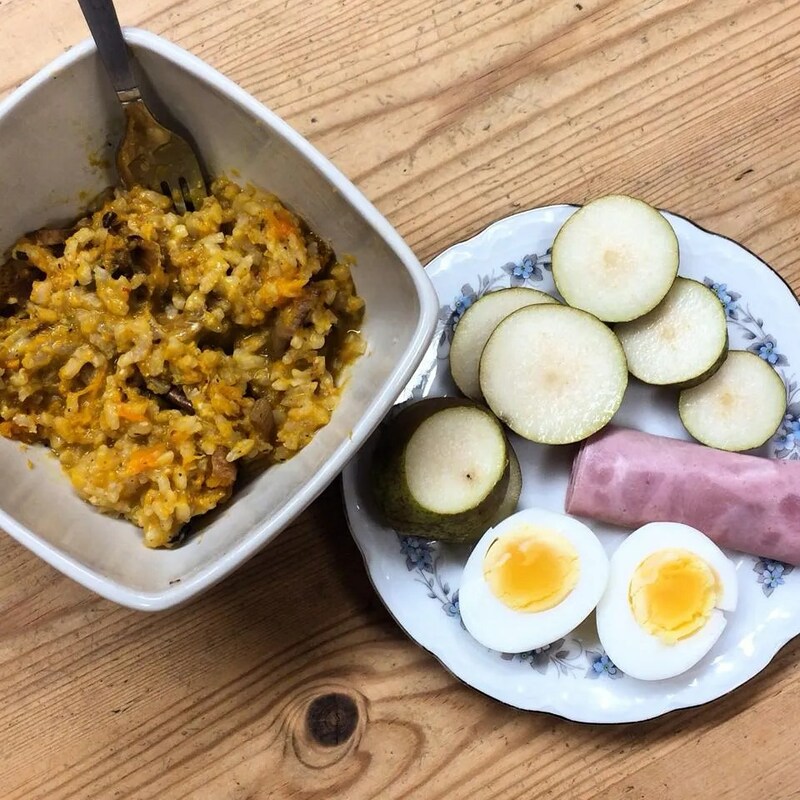 My favourite meal of the last few weeks was a wonderful risotto stuffed butternut squash, a meal that deserves its own post so watch out for it this week! To my fellow slimmers, good luck on your journey this week. To everyone else, happy eating! Congrats on the weight loss! Looks like you've made some awesome things in the last few weeks – I have managed to make some new things myself (for once!) though the endless syn eating is probs not helping me ha!